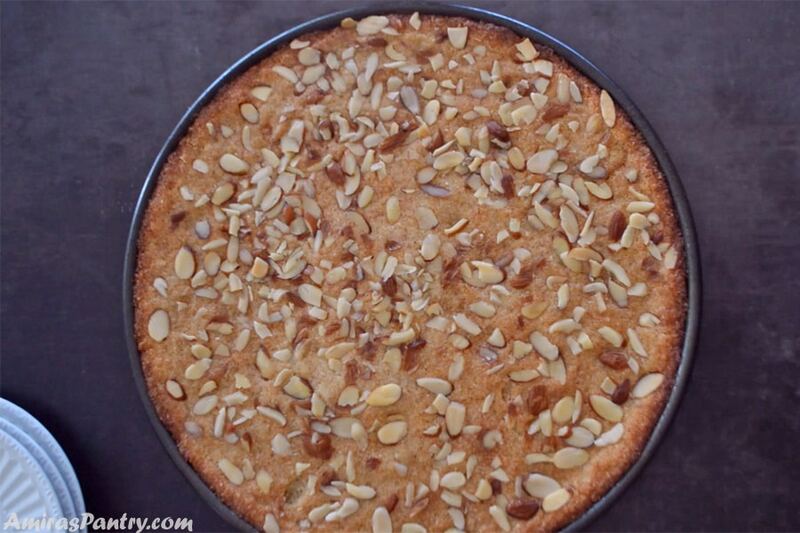 Basbousa, an Egyptian semolina cake with yogurt is one of the best Egyptian desserts that comes out fairly quick. One bowl, mix and dump kind of recipe, yet is hard to make perfect. Today I am sharing the BEST basbousa recipe that everyone was raving about. 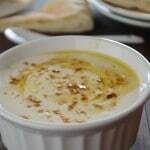 Authentic Egyptian basbousa recipe that is soft and stays soft. 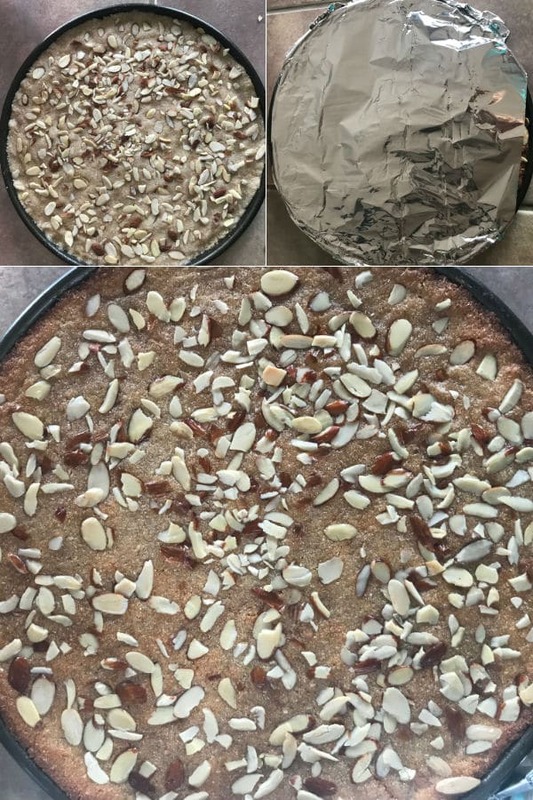 A delicious coconut, yogurt and semolina/farina cake that gets sprinkled with nuts and drizzled with syrup to put the final seal of perfection. 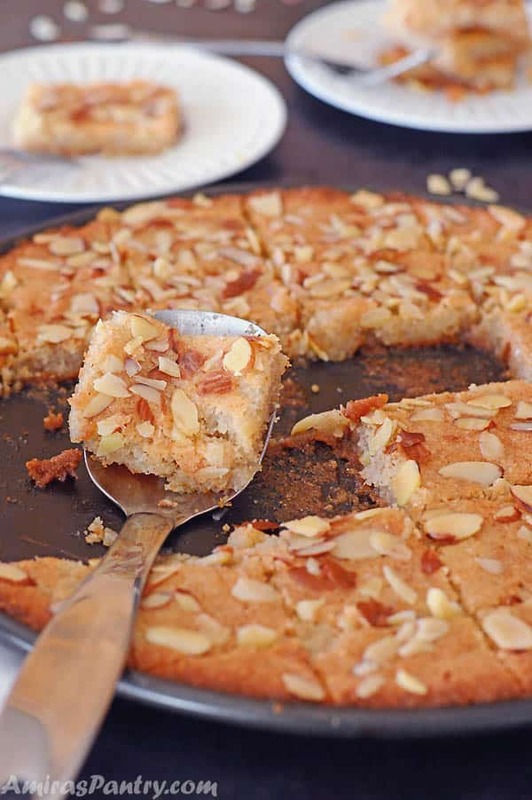 Basbousa is a term in the Middle east that refers to a very sweet semolina – sort of- cake. Verbally in Arabic we can call our loved ones “basbousa”, I sometimes call my little kid ” basbousty” which means my basbousa or like saying my sweet. 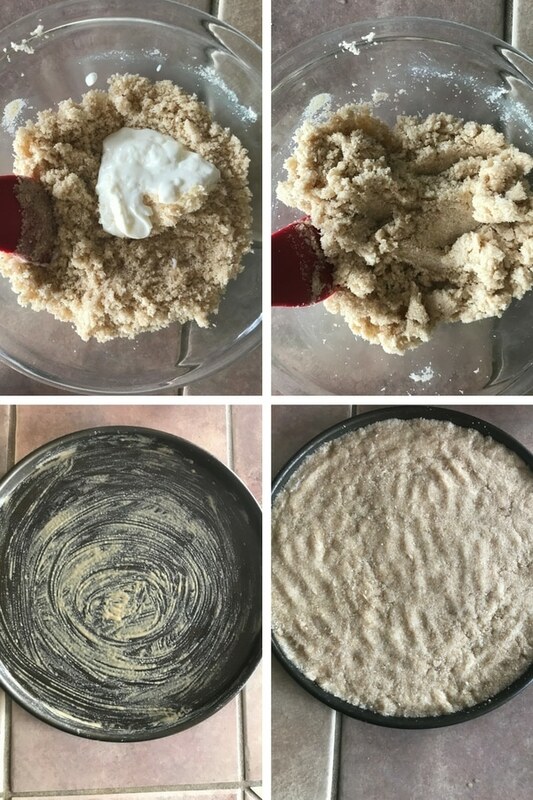 There are lots of recipes online for basbousa some call for milk some for buttermilk some even add all purpose flour to it, but this recipe is – in my humble opinion- the best and closer to what is served in Egypt. Basbousa is sold in every corner in Egypt. Each bakery shop has his own lovely basbousa. It has a secret that has been not revealed yet, but we are trying and will continue to try and we will never stop. Determination is the KEY to success. This is a recipe that I’ve made probably a hundred times throughout my U.S. life. I’ve made a couple of enhancements and achieved a very satisfying result so far. 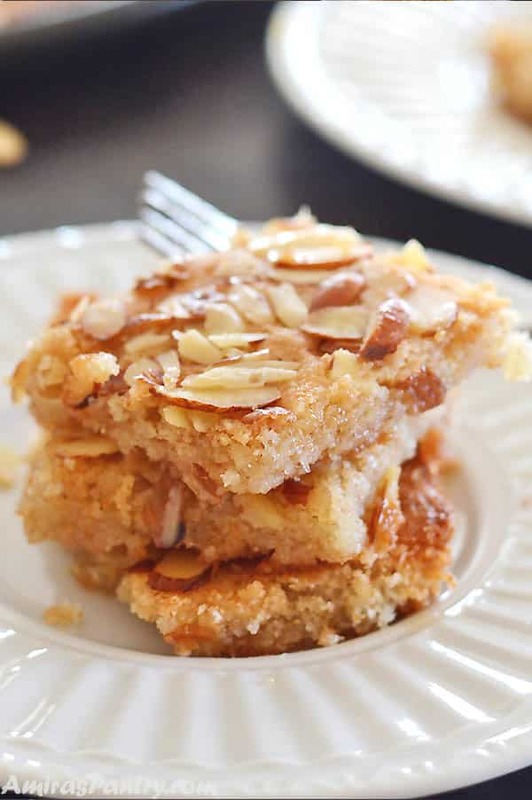 It is not thick, it is not overly sweetened, the coconut flavor is not overpowering and it is moist and tender and keeps moist and tender for a as long as you want. – I’ve used Ghee, which in my opinion made a noticeable difference in taste. Clarifying a cup and a half of unsalted butter will get you a little over one cup of ghee and we will need only 1/2 cup. Clarified butter is not that hard to make.. check out my tutorial here. – Brush the baking sheet/pan with tahini, the raw tahini paste works wonders keeping the basbousa soft. Do not go overboard though, too much tahini will make your basbousa taste more like Halva. – Mix in a tablespoon of honey or corn syrup with the batter. It helps sticking everything together. – Alway and I mean ALWAYS with any basbousa recipe, cover it after you’ve poured the syrup and while it is hot for 5-10 minutes. Actually if you have time, cover it and let it soak in the syrup overnight. – And that’s pretty much it. I’ve made my basbousa in a 12 inch rounded baking sheet to end up with pieces that is a little bit over 1cm thickness. If you would love a thicker basbousa, bake it in smaller pan, like 9″, and you can easily double/triple the recipe so do whatever seems perfect for you. In a deep bowl, add farina, sugar, baking powder and coconut flakes is using. Mixing everything well. Melt ghee and dissolve honey in it. Pour ghee over the dry ingredients and mix well with a spoon until you feel that all farina granules has been well covered with ghee mixture. You’ll end up with a well wet sandy textured mixture. Now add the yogurt and mix just enough until it disappears in the mixture. Then brush the baking sheet/pan with tahini, raw tahini please not the tahini dip . This is a tip I’ve got from many cooks, I used to brush mine with melted butter so you can use either. Spread the farina mixture evenly on the pan pressing down with your fingers. If you are using nuts, spread it over the basbousa pressing lightly on it. Bake in a 350F pre heated oven, in the middle shelf, until the edges start to brown. Now move the pan to the upper shelf of the oven and continue baking until it is nicely brown. Some people like broiling the top, but being me I can easily forget about it until I see smoke coming out of my oven. When you move the basbousa to the high shelf, start making the syrup. Simply combine all ingredients on medium until it boils. Reduce heat and simmer for about 10 minutes. Take the basbousa out of the oven then pour the warm syrup over and immediately cover with aluminum foil and return to the TURNED OFF oven. Keep it there for like 10 minutes then take it out and enjoy warm or at room temperature. 1 2/3 cup (306g) Farina. 1/2 cup (97g) plain yogurt. 1/2 Tablespoon (6g) baking powder. 1- 1.5 Tablespoon tahini. or you can use ghee. In a deep bowl, combine farina, baking powder, sugar and coconut then mix well. Melt the ghee in the microwave or stove top then dissolve the honey in it. Add the ghee mixture to the bowl of dry ingredients and mix well to combine. Add the yogurt and mix, just until everything is well incorporated. Brush a round 12 inch baking sheet with the tahini and spread the basbousa mixture evenly. Spread nuts on top evenly to decorate. Bake in the middle of your oven until edges start to brown, this took about 10 minutes. Then move the basbousa up to the higher shelf and let it continue cooking until golden brown will take anywhere from 15 to 20 minutes. When you move the basbousa to the upper shelf start making the syrup. In a small saucepan over medium heat, combine syrup ingredients and bring to a boil. When it boils, reduce heat and simmer for 10 minutes. Turn heat off and keep the syrup warm. When basbousa is done, turn off your oven and take it out. Pour the syrup evenly and cover the basbousa immediately with foil. Return to the TURNED OFF oven for 5-10 minutes. * Using coconut flakes is optional, if you do not like it then do not use and follow the same instructions. Many people though, find it highly recommended to add at least a couple of Tablespoons of coconut flakes. **Using nuts is optional as well. *** You can flavor the syrup with vanilla, cinnamon stick, rose water, orange blossom water or make it plain. I like making mine with vanilla. 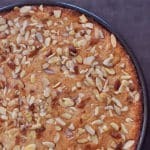 **** As I have stated in the post, this recipe baked in a 12″ pan yielded basbousa with a thickness of a little over 1cm. If you want yours to be thicker, bake in a smaller pan or double the recipe.I’ve recently made it several times in a 10.5″ aluminum baking sheet and got rave reviews about how perfect this was. ***** Calories are calculated without the nuts. I lost count of how many times I’ve made this recipe. My whole family loves it and it is so easy to make. 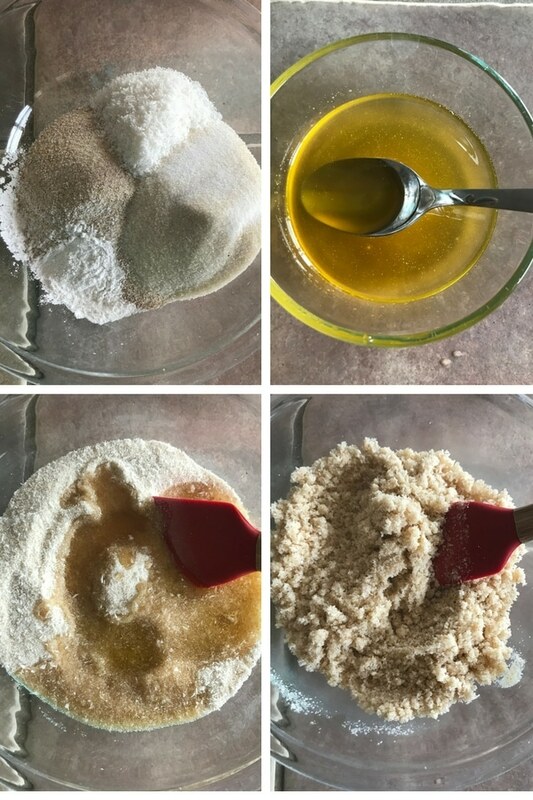 Sometimes I use the fine semolina and sometimes the coarse one, depending on what I have in my pantry comes out very delicious every time. Thanks. Sommer, can you please check this link, you can locate a rounded aluminum pan toward the bottom of the post. Also if you could check the International markets near you especially before Ramadan and during Ramadan, you could find ones as well. Hope this will help. My husband is Egyptian and he wanted so much to eat basbousa. I’ve tried a couple of recipes before and he just said these were fake basbousas 🙂 not the real ones. Really he enjoyed this one, we all enjoyed it so much and he even said this is better than their neighborhood bakery shop in Egypt. Thank you so much for sharing such a wonderful recipe. 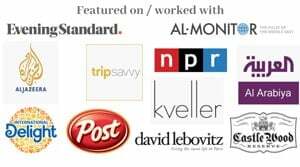 Hi Amira, I would love to try your recipe. 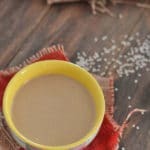 Would it be possible to update the recipe to include the ingredients by grams as well? Lila, thank you for reaching out. I will def. honor your request and make it in grams as well. Thanks you.